Many new and long-term dog owners often have issues with excessive barking in dogs, and sometimes no training can help the issue. Professional dog trainers spent years finding ways on how to stop dogs from barking, and often to stop a barking dog they recommend one of the best dog bark collar brands as an effective option and as the last resort. Dog bark collars remain a controversial subject and a focal point of many debates among dog experts. Whether it's electric or vibration dog bark collars, we've seen studies showing that dog shock collars cause some negative effects on dogs when used improperly, and it's very important to consider something like this before opting to use even the high quality, best bark collars for dogs. * Click on the best dog bark collar for more information, prices and details. Alternatively, scroll below for more options and to read reviews. Before you opt for one of the best dog bark collar options out there, it's crucial to understand more about what this device is and how it works to ensure its safety and proper use. Let's discuss all the types first. While dog shock collars used to be the most widely used method of canine behavior deterrence, alternative forms have come into the market to replace the shocking mechanism. 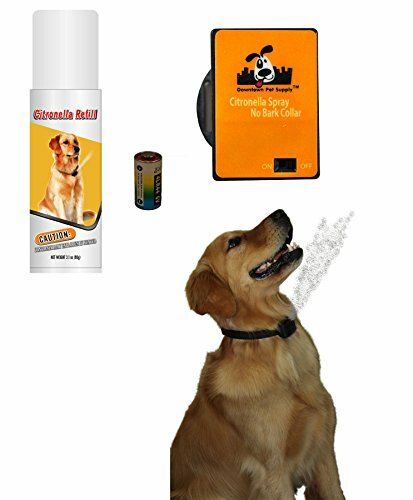 One of these new and improved designs is the little-known Citronella dog collar, which sprays a lemon-water mixture in the direction of your dog’s nose and mouth (mentioned on the below list). Dogs don’t particularly enjoy the taste of citrus, so it’s a great way to enforce a non-painful form of training. Also considered to be a more humane option is the vibration-only collars like the POP VIEW at the fourth position on the below list, or an Ultrasonic dog collar, which emits a very high, irritating sound that canines don’t particularly enjoy. Since dogs have a much sharper sense of smell and hearing than we do, some people don’t like the idea of manipulating their sensitive ears but may prefer an ultrasonic dog collar over a shock collar. Especially because it really doesn’t hurt the dog and it may function a little better than the Citronella dog collar. In comparison, dog shock collars have been made illegal in many European countries while these still remain available for use. This means that ultrasonic or citronella or vibration-only best dog bark collar options may be a little safer to use, while many professional dog trainers still argue that shock collars can be completely humane and safe as long as you know how to use them properly. It's crucial that you choose to buy the best dog bark collar only as a last option and for the right reasons. Nuisance barking in dogs has different levels to it, and it doesn't always require the use of a bark collar. Although a regular vibrating dog collar is far more humane than a dog shock collar, it still impacts canines in a way that may not be healthy. Our dogs use their bark to warn us about danger, to say hello, to get our attention, and to let us know when they’re hurt or not feeling well. By using an anti bark collar, you’re essentially teaching them that this is not only an unwanted behavior in that moment, but at any time. While you want a submissive dog, you don’t want your pet to be so submissive that they’re afraid to make any noise, especially if it’s a life or death situation, or one that involves an intruder in your home. Our pets do have other methods of communication like pawing and placing their chin on our laps, but barking is definitely the quickest way to create a sense of urgency in their owners. That said, of course sometimes barking can become too excessive where this behavior needs to be fixed (starting with obedience training and going to canine behaviorist first). Since anti bark dog collars mostly run on the vibration of the vocal cords rather than the actual sounds, you shouldn’t have any issues with other dogs causing the collar to dispatch, especially if you pick up a high quality best dog bark collar brand. Yet this is definitely something to consider when you’re making a purchase though, as each brand activates the bark deterrent in a different way. It’s probably best to avoid the ones that run on sound (cheap ones) simply because it could pick up noise from somewhere else. You should also take note that the sound of a heavy bass-line in your stereo or a motorcycle engine going by could also set off an anti-bark dog collar that runs on vibration only. If you like to listen to your music loud, just be sure to take off your dog’s collar first as a safety precaution. Like with any other clothing item or even regular dog collars, it's essential to choose the right fit. If your dog’s bark collar doesn’t fit the way that it should, it may render useless as it won’t pick up the vibration from your dog’s vocal cords. In order for the collar to operate properly, the receptor portion needs to be positioned at your dog’s throat, and tight enough to stay in place. On the other hand, it shouldn’t be so tight that your dog is in extreme discomfort. A general rule of thumb for picking up the right size best dog bark collar that fits well is that you should be able to easily slip two fingers underneath, you should not have to force it. Take a look at this fitting guide for more tips and methods on how to measure a dog and pick the right size collar. Stimulation collars for dogs shouldn’t be your first selection in anti bark training. A restless, noisy, constantly barking dog is likely to have a lot of built up energy that needs to be expressed somehow. If your dog isn’t receiving adequate exercise, it can definitely make a major difference in your dog’s excessive noisiness. Take a look at these dog barking training tips on how to solve this problem without spending money first. Increased playtime often helps with solving excessive barking problems. Daily runs and workout sessions along with short obedience training sessions go a long way if they’re done correctly and consistently. Only after you've exhausted these options and discussed the issue with a professional dog trainer should you look into one of the best dog bark collar choices. Instead of using your ultrasonic, vibrating dog collar, or citronella dog collar to eliminate all barking from your dog, just use it in situations where the canine behavior isn’t appropriate. For example, you obviously don’t want your pup yapping at every man, woman, dog, and child who walks by. However, it’s not a terrible thing for your dog to bark a little when someone rings the doorbell. Our dogs do want to make us happy and protect us, so consider allowing them to keep some of their internal need to communicate with us. No matter which best dog bark collar you choose, never use these devices on young puppies – they’re still growing and some barking is age appropriate and is to be expected among dogs that are younger than one year of age. Small dogs and puppies are also much more susceptible to be harmed. If you want a high quality, waterproof, malfunction-resistant best dog bark collar, it’s better to get one that costs a little more and is made by a reputable brand such as Garmin, SportDog, PetSafe or Pettrainer. Obviously, you don’t have to spend thousands of dollars on this device, but you should consider purchasing one with several options provided as far as strength and deterrent settings go. Anti-bark dog collars that start at a lower cost sometimes actually run on sound, rather than vocal cord vibration. They are manufactured in China using the cheapest materials and that's why they cost so little. Avoid these if possible, as they make pick up the sound of other things going on around your dog and shock or warn them needlessly, and are more likely to malfunction and harm the dog. Because of the way these devices work, don't take this decision lighting. The first thing to do before buying any type of best bark collar for dogs is to do your research, consult with a veterinarian, a professional dog trainer and other canine experts about your specific situation. It's important to gather the information before you subjugate your pet to the use of no bark collars. Picking the best bark collar for small dogs will be much more difficult as well. I must note that many dog experts agree that using no bark collars is an effective method that can be done very safely and have explained that majority of mentioned safety issues come from dog owners who misuse anti bark collars or buy the cheapest, lowest quality barking collars. We've also interviewed some professional dog trainers that conclude that using best bark collars can be a safe training tool. Scroll down to watch a video on testing bark collars and debunking some of the myths about these devices. 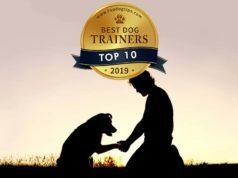 Read our interview with a professional dog trainer who explains the proper use of the best bark collars for dogs and how to choose the safest, highest quality one, including picking the best bark collar for small dogs. You'll note that his picks are in line with our top two best dog bark collars manufacturers – SportDog and Garmin. He does not recommend option for cheap no bark dog collars. So if you choose to train yourself to use these devices, make sure you know how to use them properly. The first one of the best bark collars for dogs is from a famous company that also manufactures a lot of technology for people, Garmin. This second best dog bark collar is waterproof, and the rechargeable lithium-ion battery lasts up to three months per charge. Buyers can add more Delta dog collars to the pack and train up to three dogs with one handheld device. This anti bark dog collar uses the company’s innovative BarkLimiter technology, which is an accurate bark correction tech. 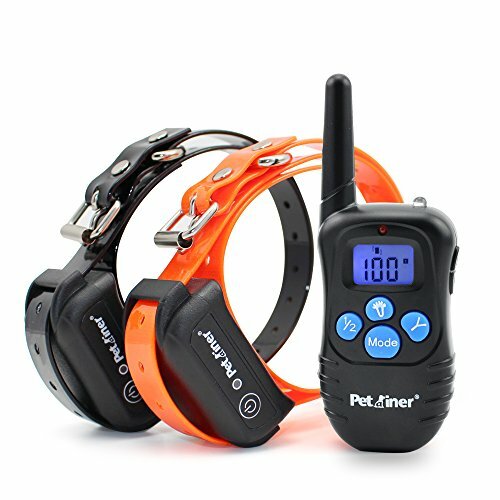 This dog bark collar package includes the collar only, so one must order the full package with the handheld device in order for this product to work to its full efficiency. This makes the bark collar a little more expensive than one may wish, and the Garmin's best dog bark collar is one of the most pricey options on the list. After looking through the dog bark collar reviews, although there aren't as many as for the SportDog one, it's still clear that this bark collar for dogs is loved by most customers looking to keep canines in a certain range. It sends vibrations if the dog gets too far away, whether simply in the yard or on a camping trip. The price is expensive but some find it to be well justified because of the overall high quality of this second one of the best bark collars for dogs when compared to cheaper versions. Dog owners love that anti bark collar is waterproof so that dogs can be in the water without ruining the functionality of the collar. Another bonus is that most Garmin's bark collars for dogs including Delta Training Device can be set at different levels, even when using the same handheld device, which is beneficial for pet parents with dogs that are different sizes and/or breeds. Most of the negative comments stem from customers who do not realize that one must buy the handheld device for this product to work as advertised. The issue is on the manufacturer though, since they should clearly disclose this information. The battery indicator may be an issue for some because it tends to show that it is completely charged, which could be inaccurate as well. So a word of advice: when shopping for cheap no bark dog collars, make sure to read descriptions. The second one of the best bark collars for dogs is the one from the most popular pet company responsible for manufacturing the highest quality pet technology – SportDog. This anti bark collar for dogs uses SportDog's patented sensor system to detect barks, making it one of the most reliable dog bark collars on the market available today. To deliver a correction and stop dog barking, this no bark collar must detect vibrations from the canine's vocal cord and the sound of the bark. It fits neck sizes ranging from 6 to 28 inches and has ten levels of correction. As an added safety feature, these SportDog's best bark collars for dogs will shut off for three minutes if a dog barks more than 15 times in 50 seconds. Due to its strength, this is not the best bark collar for small dogs and is better used with medium and large breeds. Majority of bark collar reviews show pet owners agree that these dog barking collars are successful in delivering everything that was promised by the manufacturer. This best bark collar easily and quickly stops dogs from barking, often within only one or two uses. Many have had success with removing the anti bark collar after a short period of time once they felt their dog was trained to stop barking. 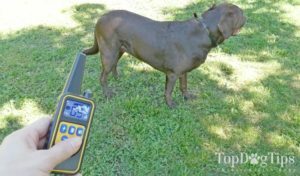 Some dog owners feel as if this SportDOG second best dog bark collar may deliver a shock that is too strong for their pooch, even considering the lowest of the ten levels of correction that are available. Although the product description mentions the requirement of an audible bark and vocal vibrations, some customers claim that it may shock dogs when both of these are not present. Ultimately, SportDog collar fits better the description of best cheap no bark dog collars since it's about 30% cheaper than the above Garmin one, but is slightly less value for the price. Even so, SportDOG are one of the best dog bark collar brands out there. Our third one of the best bark collars for dogs is another product from SportDog. This waterproof anti bark dog collar aims to cure excessive barking in dogs safely with ten levels of correction, catering to all breeds and sizes of pups. This no bark collar bundle includes two rechargeable batteries, a charger, operating guide, and lifetime limited warranty. Dog owners may choose between one of three training modes, all of which require vibration and sound to trigger the correction. The three modes of this best bark collar include temperament learning mode, which starts at a low-level correction and increases with each successive bark and helps to stop dogs from barking. Its progressive correction mode, which starts at the lowest level and progresses when dog barks are within 30 seconds of one another, and user-selected correction mode, which allows the user to choose the level that will be used every time the dog barks, is what makes this product one of the best bark collars for dogs. 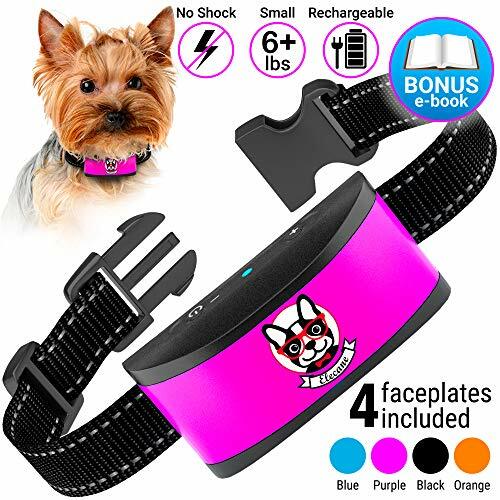 If you take a look at the dog bark collar reviews (link above), you can see that although many pet parents express that there may be cheaper options available, majority say they would not choose them over this anti bark dog collar because if its quality. Pet owners love that this is a humane option for treating excessive dog barking because of the progressive options that are available. Some customers even note that their pet still doesn’t bark once the SportDOG Bark Control Collar has been removed. Pet owners and their neighbors shopping around for the best cheap no bark dog collars can both enjoy quieter evenings thanks to this anti bark collar without using it after the training process is over. 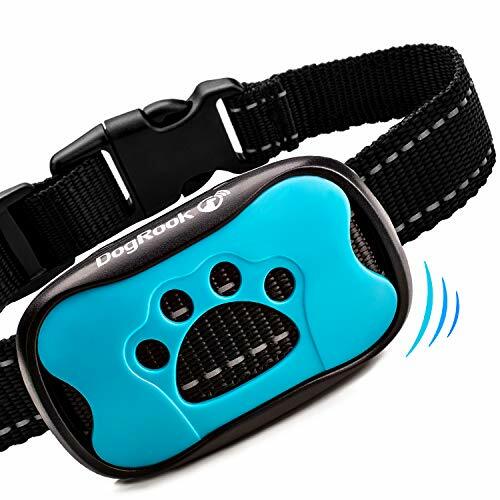 On the disadvantages side of this best dog bark collar, some customers reported that this device may shock dogs when they are not barking, whether it be from growling or the bark of another dog within a close distance. This can become an issue and should definitely be looked into in case you decide to go with this option. Pet parents feel the shock delivered by this anti bark dog collar may be too strong for smaller breeds, even when on the lowest setting. Even though SportDog is know as one of the best dog bark collar brands, this one may be a little less safe for many. Fourth one of the best bark collars for dogs is made by a company called POP VIEW. It looks that they specialize in humane no bark devices and how to stop dogs from barking. This company guarantees that their device is the best dog bark collar and can safely and effectively stop excessive barking in dogs without being harsh on the dogs. The POP VIEW best dog bark collar is recommended for dogs between 11 to 120 pounds, or neck size 7 – 21 inches, and this anti bark collar sends both warning sounds and vibration to the dog when it barks. The level of correction gradually increases with each bark, and, after reaching the seventh level, this no bark collar will automatically stop working for one minute for safety reasons, ensuring the dog receives minimum stimuli. This fourth best dog bark collar seems to be gaining a lot of attention of pet owners who choose more humane dog bark collars with no shock. POP VIEW best dog bark collar manufacturers recommend waiting until the dog is no longer a puppy before using this, as it may be too strong for young, small animals. This dog bark collar package includes a receiver, operating manual, and an extra replaceable battery. When looking through the dog bark collar reviews of POP VIEW device, even pet owners of the most stubborn of canines have had success with these humane bark collars for dogs, noting that obnoxious barking has finally come to an end. Many dog parents have been able to turn the bark collar off or completely remove it and still enjoy quiet, bark-free days and nights. No matter the reason for the bark, most dogs seem to cease all barking after only one or two days of wearing this no bark collar. As with many other anti bark dog collars listed here, certain dog owners feel that this product is too intense for their pets. A few of them have noted that this best dog bark collar picks up background noise, which induces stimuli when dogs may not deserve it. A minor subset of owners have witnessed this dog collar affecting dogs while they were eating, sleeping, or simply walking around the yard or house, which is a definite issue, although only very few have seen this to be the case. Last one of the best bark collars for dogs is a device from another popular company, PetSafe. This waterproof PetSafe deluxe bark collar for dogs is recommended for canines weighing at least eight pounds, and it adjusts from 8 to 28 inches. It has three different modes and six levels of correction within each mode, allowing you to choose how strong of a vibration your pet will feel. This no bark collar features a low-battery indicator and claims to possess perfect bark detection. This is one of the best bark collar for small dogs due to its design and medium level of pulsation. After looking through the best dog bark collar reviews, it seems that this device may not be as harsh as some other models, making it a great option for pet owners who may be weary of using bark collars on their dog(s). 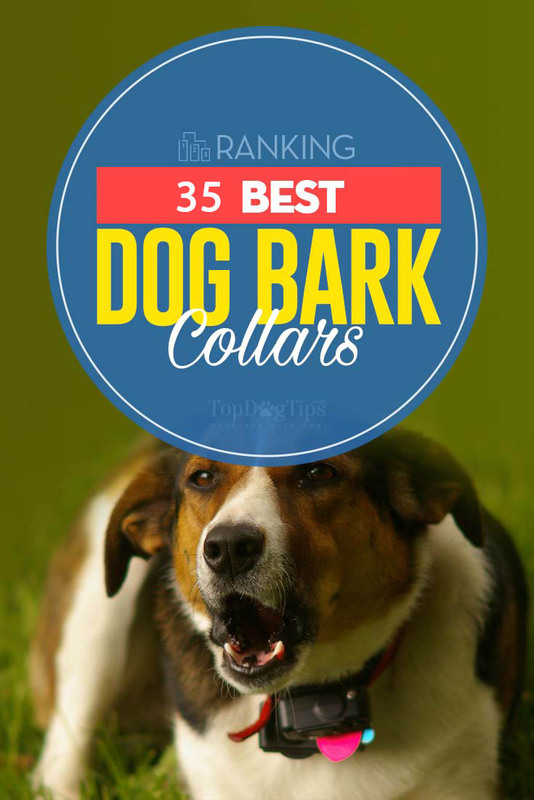 This can also be one of the best dog bark collars for small dogs. Certain dog owners said their pet shows no reaction at all when this anti bark collar is on the lowest setting. As with other no bark collars for dogs, many dog owners have noticed a reduction in barking even when the dog is not wearing PetSafe Deluxe Bark Collar. Despite the lower setting, most dogs still reduce or completely eliminate their barking within a day or two. Complaints and/or negative comments regarding this anti bark dog collar are minimal, which is highly unusual on most products available. It could also be due to lack of sales. This highly efficient bark collar has three training mode levels that have zero to 100 sensitivity or stimulation levels. This device works within 900 ft of remote range so that you can train your dog in a wider open space. The remote and receiver are rechargeable and come with a one-year warranty. This set is good for two dogs. The best thing about this particular training bark collar is that it can work up to 1000 ft range with its remote control. So, if you are hiking and wandering off with your dog outdoors, you can still keep your furry pet's excessive barking under control. This collar has three training modes: tone or beep mode, vibration mode (Level 1 to 8), or shock mode (Level 1 to 16). Adjust the collar to the mode most suitable to correct your dog's behavior. Use the remote to also call back the dog easily if he has wandered too far or to stop aggressive dogs from fighting other animals. The BESTHING collar is waterproof and works even when your dog is swimming happily in the river. When properly recharged in two hours, the remote's battery works for 60 days on standby, while the collar works for 15 days. This bark collar works well for stubborn dogs that may resist training. Featured with an intelligent chip, the collar comes seven easily adjustable sensitive levels. It won't be able to detect other barking dogs except your own. Lovatic's bark collar is also featured with a free waterproof pet safety light that enhances your dog's safety and visibility, especially when you and your buddy are walking at night. The light has three flashing features: slow, steady and fast. MARDOG's bark collar fits dogs in all shapes and sizes with its adjustable straps. The mechanism itself is very lightweight and won't be bothersome when worn. This collar comes with a smart chip that can detect the dog's particular sound so that the vibration and beeps won't set off with any other noise. This is a no shock collar so it's the more humane way to train your dog. Instead, it progressively vibrates for 10 seconds whenever the dog barks. The REGIROCK bark collar is featured with a durable metal casing that's still lightweight and comfortable when worn. Your dog won't notice the collar at all but he will be alerted to the vibrations and sounds that set off whenever he barks excessively. This device has an optional shock or no shock mode. You can turn it off if you're wary that the collar might cause a distress. The REGIROCK also has an intelligent detection chip that will set off only for the dog's sound so that false triggers are avoided. Use this for dogs from 15 to 150 lbs in size. Downton's bark collar emits short bursts of a lemony citronella liquid that will stop a dog's incessant barking. Its no shock, no loud noise and no pain features are completely humane. The collar itself is made from high-quality nylon that will not break so easily. It's more than durable to carry a fill port where you have to refill the citronella that's good for 15 sprays. The same port also houses the battery slot that keeps the collar operational. The Allenker bark collar has three levels of sensitivity and three modes for training the dog to stop barking. It is fitted with a test bulb and a sensor so that you can adjust to the most comfortable level to effectively train your dog to curb a bad habit. This collar also has a smart chip that eliminates false triggers. This bark collar is designed with a LED screen and breathing light features that make it convenient to detect the dog at night or outdoors in the dark. This device is rechargeable and waterproof and the lights can be easily seen within a 200-meter range. The Omind bark collar delivers seven levels of sounds, vibrations and static shock to break a dog's excessive barking. It works according to your settings and delivers an effective trigger that will teach the dog to keep quiet when needed. This device has an auto shut down feature that will temporarily suspend the vibrations and shock to protect the dog after seven triggers. 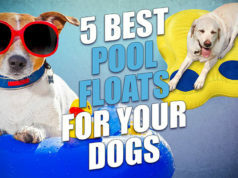 It works best for pups at the age of six months and above with a weight of about 15 lbs. The Omind bark collar, however, must only be used for healthy dogs, while aggressive or strong dogs might need additional training from a dog expert to curb the barking. This collar has rounded silicon prongs that won't cause a discomfort for your dogs. Featured with seven sensitivity levels, this bark training collar delivers a beep, a vibration, or a gentle shock that controls your dog's unnecessary barking. This device also has an auto shut feature that will turn off after three cycles so your dog will not be stressed out by the vibrating sensation. The collar's faceplate comes in different attractive colors — such as mint, royal blue, and topaz — that will fit the owner's preference. Moer Sky's bark collar features five levels of vibration and four levels of sensitivity. However, each level offers a harmless way of correcting the dog's behavior. It's recommended, however, that you start with Level 1 if this is the first time the dog has to use a bark collar. The sensitivity level of the collar is accurate. It will not falsely correct the dog with mere paw scratches or external factors like the bark of nearby dogs. As with the vibration level, you may also set the sensitivity to Level 1. For larger dogs, however, you might have to raise the vibration and sensitivity to a higher level, otherwise, the bark collar won't set off. Moer's Sky bark collar has an auto-protection mode. After five activations, the mechanism will be on sleep mode for 60 seconds to prevent excessive correction. This product comes with extra pairs of electrodes, USB cable for charging, and a three-year warranty. To effectively use this bark collar, charge the device for two hours first. The bark collar from Shock Collar for Dogs is an upgrade of its previous release. This device requires no sensitivity level adjustment as it can automatically detect the dog's barking to avoid the need for excessive resetting. This collar has an alert tone and a vibration indicator that ranges from Level 1 to 7. For the first and second barks, the collar will vibrate lightly and emit a green indicator. The third to fifth barks will let the collar vibrate with a blue indicator. The sixth and seventh barks will show a red indicator as it vibrates. If the dog continues barking after seven alerts, the bark collar will automatically stop working for one minute and then reset. This doesn't emit static shock, so it's very safe and humane for training the dog. The Shock for Dogs bark collar comes with a remote control. It ideally fits neck sizes from 3 inches to 8 inches. This bark collar is lightweight, comfortable and ideal for dogs weighing 7 to 120 lbs. It has seven sensitive levels and three levels of alarms that set off a vibration, a sound, and a static shock. Set the collar at different levels when you're training the dog to stop barking when it's not appropriate. With its intelligent training feature, this collar ensures that only the dog's sound can be detected. The COSEZIN bark collar is waterproof and quite useful for long time standby modes of up to two weeks. It is fitted with rechargeable USB batteries that require three hours of charging. Designed to keep your dog's barking under control, the SUPERCUTE dog bark collar has a no shock mechanism and a microprocessor that sends different levels of warning tones and vibrations. The use of this collar to train the dog doesn't promote pain or distress. It also has a voice recognition feature that won't set off because of other sounds so it's very safe for pets. The SUPERCUTE bark collar has a durable and adjustable strap that can fit dogs from 15 to 110 lbs in size. Its golden plate is quite eye-catching with its striking color. This dog bark collar entails multiple levels of sound and vibration to train dogs with excessive barking habits. None of the levels include a shock or spray mechanism that might cause distress. The Four Stones collar is featured with two reflective safety strips that can be helpful if you're outdoors in the dark with your pet. The collar will also appeal to owners who love a techie design. Perfect for small noisy dogs like the chihuahuas, this bark collar offers no electric shocks to train your dog to curb its barking habits. It's fitted with a chip that recognizes the vibration on the dog's throat thus preventing false triggers. The ELECANE anti-barking collar is USB rechargeable and waterproof. It comes with five faceplates with different colors so that you can change or mix and match it with yours or your dog's outfit. The Casfuy bark collar comes with a digital display that shows the three main training modes. Switch to the mode you think would be best to control your dog's barking in a given situation. For instance, if your dog keeps howling at night whenever something startles him, put the collar on, set the training to beep, vibration or shock, and then adjust the sensitivity levels from zero to seven. This collar is suitable for all dog sizes and can work both indoors and outdoors. It has reflective strips so you can still spot your dogs in the dark or under low visibility. The collar works with USB rechargeable batteries. This lightweight bark collar is featured with the advanced sound-detecting technology to lessen false triggers. Its sensitivity levels are set from one to five to work well on a variety of dog sizes. You may easily adjust the sensitivity levels if the bark collar sets off when the dog snores or scratches its neck. This device is rechargeable and waterproof. Its battery life can last 15 days on standby following a two-hour full recharge. Use this collar for dogs weighing six to 120 lbs. The Masbrill bark collar is designed for small and medium dogs with its mini-strap, lightweight faceplate, and buckle. This collar does not come with prongs or shock. It makes use of progressive vibrations to train the dog to stop the unnecessary barking. This collar has rechargeable batteries and cable, as well as a 100 percent waterproof design, which works great for tiny dogs who love to swim. Masbrill offers a full year warranty for this device. The DUYKQEM bark collar is proud of its stable chip. This means that the vibration won't set off whenever the dog scratches or there are other dogs barking nearby. The DUYKQEM is also featured with a high-quality nylon band with prominent reflective strips so that you can easily see your dog when you're walking outdoors at night. You'll get extra electrodes with a purchase of this collar, which works well for pets with long hair. The electrodes run up to 13 voltage when shocking and only if the bark is persistent. The GYM bark collar has seven sensitivity levels and three types of training modes that are painless, harmless and won't cause any stress to the dog. The vibrations and shock modes are adjustable in four levels: zero or off (0), light (L), moderate (M) and high (H) so you can set it to what's most convenient and comfortable. This bark collar features a breathing light that alerts you to wherever the dog is in a dark environment. This light is good from a distance of 150 to 200 meters. This collar helps silence your dog with minimal shock that won't hurt or distress since you can set the intensity of the vibration to light, medium or high. The Fenvella has a smart auto protection mode that can discern the intensity of the dog's bark so that it won't trigger erratically. The adjustments on this collar can fit most dog sizes from 6.6 to 100 lbs. The strip is also durable but easy to clean via washing and air drying. The ELenest bark collar has a barking detection chip that improves on the sound detection so that it only recognizes your dog's bark. This has five safe shock and vibration levels that won't bring harm to your dog during his training. The collar also comes with a strong plastic buckle and high-quality thick nylon with reflective strips. It is safe, easy and comfortable to use. It's also very effective in curbing your dog's loud barking. The Tebaba bark collar will automatically correct your dog's inappropriate barking behavior. Featured with 7-grade sensitivity setting and three training modes, this bark collar has an effective no harm shock result that can work for small, medium or large sized dogs (6 lbs to 120 lbs). The collar requires USB charging for one hour only. The batteries can last 15 days on standby until the next recharge. The Tiftaf bark collar promises long-lasting batteries that won't drain out after an overnight use. It also has a voice sensor that can detect just your dog's sound so that there are no false triggers. The collar has three training modes that will progress as the barking intensifies. It starts off with a beep, then a vibration, then a small but harmful shock that will not hurt nor cause distress in the dog. The collar also has a user-friendly LCD display that shows the vital information like sensitivity and battery levels. It's very easy to use and operate this device. The Yao Yeow bark collar is simple to set up. Found on its LCD panels are four buttons for the power, the vibration setting, the sensitivity setting, and the shock setting. Adjust these settings to the level that will work effectively for your dogs. The LED screen also helps locate your dog when it's dark at night. This collar requires charging using a USB adapter. Rein your dog's attention-seeking barks with this dog collar. CMFlower is featured with different tones and vibrations that trains your dog to stop the nuisance barking. This has a no shock system with three training modes: beep, vibration and a combination of beep and vibration. The FancyGoo collars come with a digital display screen that shows all the vital details and controls for power, vibration, shock, and sensitivity. Save money on bark collars with this two-in-one pack if you need to train two dogs in your household. Both devices in this pack come with 100 percent waterproof reflective nylon straps. The GoodBoy bark collar has an air sensor that can detect your dog's bark. It also has a simple but intelligent LED screen that shows the eight sensitivity levels of the vibrations in color codes. The collar is easily adjustable to fit a maximum of 19 inches neck size. The VegasDoggy bark collar is an improvement of its previous iteration. This model is a lot lighter and features a LED display and rechargeable batteries. This collar also has an auto protection mode and a shock/no-shock setting that was missing from its older versions. The DogRook bark collar has seven different vibration and sound settings that pose no harm to the dog. You can correct the behavior safely and effectively by adjusting the collar's level of sensitivity to the dog's bark. This device will emit a warning sound on the first and second barks. It will then vibrate and sound off on the third bark. The vibration and sound will gradually increase in intensity until the seventh bark. Made with adjustable nylons, this collar is fitted with two plastic probes to detect the dog's sound. This requires two 6v alkaline batteries to function well. It is also featured with a sleep mode that stops working a minute after seven successive alerts. The DogRook bark collar is ideal for dogs with a neck size of 9 to 22 inches. It can work for pups that are at least six months old. Whatever best dog bark collar you buy for training your Fido to stop barking excessively, always keep in mind to never leave these devices wrapped on your dog's neck for more than 10 hours. Ensure that the batteries are properly charged and the device is accurate, working as intended. If the dog won't stop barking despite the training with anti-bark collar, take notice of his behavior because he might be alerting you on something that really needs your attention: a thief, intruder or a potential danger to your home.